IBM and Fujifilm have demoed a 154TB LTO-size tape cartridge which could come to market in 10 years' time. While it falls short of the Sony 185TB development, it should, with IBM's tape partnerships, see Sony exit the field. The Sony development involved a 148Gbit/in2 tape density and its own tape design to achieve a 185TB uncompressed capacity. IBM has been working with Fujifilm to extend today’s Barium Ferrite (BaFe) tape particle technology to achieve 85.9Gbit/in2. IBM’s boffins in Zurich have been working with FUJIFILM on pushing tape density forwards since 2002. In 2012 we heard about a 125TB tape effort, with a 100Gbits/in 2 areal density. A 35TB raw capacity tape was demonstrated in 2010. Today's LTO-6 tape cartridges have a 2.5TB raw capacity. The density developments rely on smaller magnetic particles, narrower tracks, meaning more tracks on a 1/2 inch-wide tape, and better read:write heads to follow and read/write to/from these tracks. The reader in the 154TB demo is 90nm wide. Click here and navigate to page 51 in the PDF to see the original chart. Sputtering is a process where atoms from a source piece of material fly off and are deposited onto a target (substrate) material in a vacuum chamber, when the source is bombarded by high energy particles. It is a form of erosion with the freed atoms getting deposited on the first available surface. 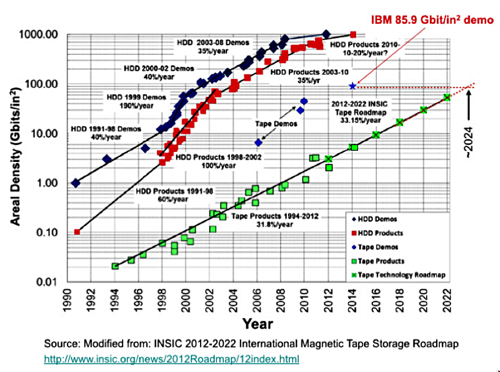 IBM’s announcement includes a graph showing that its new tape technology could come to market in 2024. Vulture View: With its LTO connections, such an IBM technology could well banish Sony’s impressive 185TB effort to the tape wilderness. Reckoning on LTO generations doubling capacity we could see a hypothetical LTO-22 pass the 154TB mark. However, if IBM’s chart with its 2024 data is right, then LTO generations – which generally arrive at 30-month intervals – are going to more than double capacity.